Florida Southern’s J.T. Hintzen has been named the winner of the fifth annual Perfect Game Brett Tomko Award.The annual award is bestowed to a college baseball pitcher whose on the field performance is deemed the most outstanding at the Division II level. Hintzen tied for the NCAA D-II lead with 14 wins (14-0) and was 10th in the nation with a 1.77 ERA. His 32 appearances placed him second in the division. Those numbers, along with his 0.78 WHiP (walks and hits per inning pitched) were all tops in the Sunshine State Conference. Additionally the senior was eighth in the country with 8.77 strikeouts to walk ratio and also finished in the top twenty nationally with 114 strikeouts. His 10.61 strikeouts per nine innings was sixth in the SSC while his 1.21 walks allowed per nine innings was third best in the conference. During the regular season Hintzen won 12 of his games and earned a pair of saves out of the bullpen. 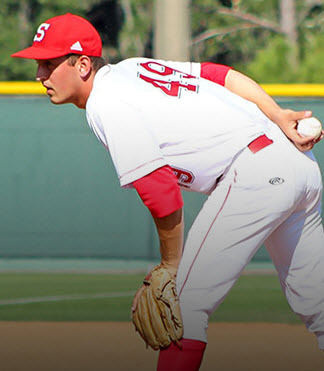 In the NCAA South Regional and NCAA National Championship Tournament, in his first two career starts as a Moccasin, threw 17 innings while only allowing six hits againstTampa and Texas A&M Kingsville to add to his win total. Following the season the Milwaukee Brewers selected Hintzen with their 10th round pick (305th overall) in the Major League Baseball First-Year Player Draft. The inaugural Tomko Award was bestowed on Dan Altavilla of Mercyhurst in 2014 after he went 9-1 for the Lakers which included five shutouts and a 1.23 earned run average in 12 starts. Altavilla is now a pitcher for the Seattle Mariners. In 1995, Brett Tomko had a spectacular season pitching for the Florida Southern College Moccasins which was full of both incredible individual and team success. Tomko compiled an incredible 15-2 record with a 1.35 ERA and amassed 154 strikeouts in just 126.3 innings. He also threw seven complete games, three of which were shutouts, and also added a pair of saves. Tomko led the Mocs to the Division II Championship and threw a complete-game shutout to give FSC its eighth national title. He was named the outstanding player of the Division II Championship and was the Sunshine State Conference Pitcher of the Year and Male Athlete of the Year. Tomko earned the distinct recognition of being the first athlete ever to be awarded both the NCAA Division II Player and Pitcher of the Year by the American Baseball Coaches Association. Following Tomko’s historic season in Lakeland, the Cincinnati Reds drafted him in the second round of the Major League Amateur Draft. He made his big league debut with the Reds two years later and went on to win one hundred MLB games in 14 seasons. Five times Tomko reached the double-digit win plateau while pitching in the big leagues and he was also able to accrue over 190 innings on the mound five times as well.